Vaishnavi Sanga - Women's Retreat - Sep 2, 2017 ~ The Toronto Hare Krishna Temple! 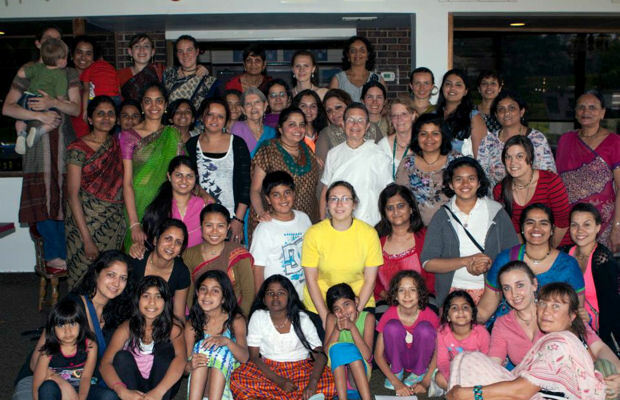 The Hare Krishna Temple has been organizing a yearly Vaishnavi Sanga Retreat (Women's Retreat) for the past five years. This year, once again, we would like to invite you to attend the ladies-only retreat that will be held on September 2nd from 9 am - 9 pm! The Vaishnavi Sanga Retreat is a wonderful opportunity for all Vaisnava ladies of any age group to take time off from their busy lives and get together for some fun activities and for spiritual nourishment. This intimate lady gathering is a unique opportunity for us to open our hearts and discuss spiritual topics that are specifically geared towards women who practice devotional lives. Whether you are a mother, a student, single, retired or even new to Krsna Consciousness, this retreat is just for you. During this one day retreat, we will get together, enjoy sumptuous prasadam, engage in some fun activities and attend two seminars by Laxmimoni Devi Dasi. As a special treat, at the end of the day, we can all sit down and participate in a ladies-only kirtan session. This year's event will be hosted by Gir Farms, located in Caledon Ontario, a mere 40 minutes drive from downtown Toronto. We will start the morning at 9 am with a delicious breakfast and end with a kirtan session at 9 pm. To register for this year's retreat, please click here. Please update the address. Thanks and haribol! Rides are being worked out. It would be best to contact us directly through info@torontokrishna.com with your contact details and we can put you in touch with the organizers!